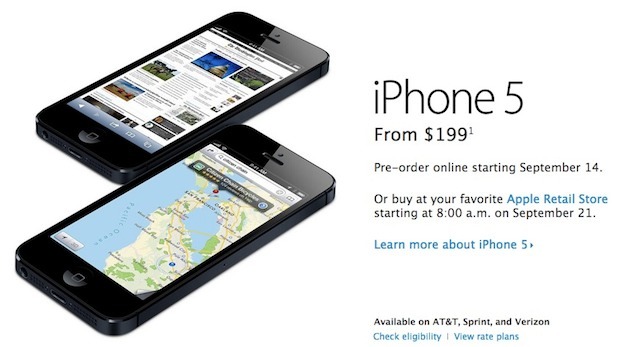 iPhone 5 pre-orders are starting at 12:01AM Pacific Standard Time (3:01 Eastern) on September 14 – midnight tonight. The pre-order date was previously announced for Friday, September 14, but the beginning time was uncertain until now. Since then, MacRumors notes that both Verizon and Sprint have come forward to announce the midnight ordering, and presumably AT&T will follow suit. 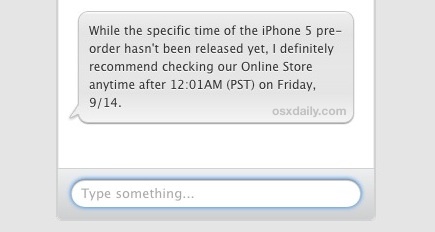 You may want to set an alarm clock or reminder for your appropriate time-zone if you’re interested in pre-ordering an iPhone 5 for arrival on release day on September 21. Typically the initial batches of pre-orders sell out fairly quickly, and shipping times slip a few days once this occurs. Alternately, waiting in line at any Apple Store or reseller remains a perfectly viable option on release day as well, and is almost always a guaranteed way to get your hands on any hot Apple device right away. Sprint, Verizon, and AT&T each will offer iPhone 5 immediately on release day. Pre-Orders for iPhone 5 to Start Friday, September 14? Pre-Order iPhone 5 on September 30? For Canadians, 12:01AM appears the same on Apple.ca too. Get it!